If I were to take a wild guess, I’d say that there is way over a hundred fairly popular online business courses available on different sites. While this does sound great for anyone who wants to learn how to take their undertaking off the ground, there is a “slight” problem with the quality of many of those courses. To be more exact, when you’re searching for a new program to join, you can’t really know for sure if the thing is going to be quality or not. Everybody has great promotional videos, sales messages, testimonials, and what not, so that at first sight, every such program looks great. But it’s only after you’re two or three weeks in that you’ll know if it’s actually working out or not. Even though such message doesn’t sound that bad right away, it’s actually a mind trick. And the trick is simple: if you fail, it’s your fault (because you didn’t work hard enough). I’m sorry, but if 90% of your “students” fail to achieve the promised outcome then it’s not their failure, it’s yours – the teacher’s. And this is where Niche Site Duel (NSD) comes into play. This is the second edition that’s just started. It’s run by Pat Flynn and focuses on teaching you how to create a niche site and make money with it (sorry for simplifying the idea, Pat, if you’re reading this). Anyway, Pat understands that the best way of teaching is by example. That’s why in NSD, Pat builds a niche site himself and presents every step of the process with detailed descriptions, tutorials and so on. It’s free. I love free. Pat is not afraid to take the responsibility for what he’s teaching. He’s decided to lead everyone by example and if the program fails to achieve results (which it won’t) then Pat will be the one to blame. 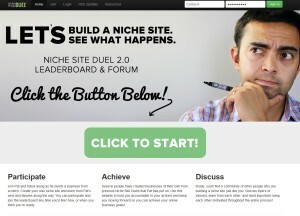 There’s a hub for the duel at http://www.nichesiteduel.com/. You can get the most updated info, guidelines, rules, and so on, there. Everyone starts by picking a keyword they want to tackle with a new niche site. Getting a domain and launching a site revolving around this keyword is the next step. The final step is to make this niche site the go-to resource for its niche. Obviously, that third step is the tough part where the action happens. Now, why is it called a “duel?” Because it’s a race to see who can get the best results and “win” the duel. Granted, this isn’t a course per se. It’s more action based. This means that every participant learns along the way by looking at what others and Pat are doing, and then in the end everybody wins. The only question is: Are you in? I am. Feel free to connect with me on the NSD forum.